Will the federal government ever agree to meaningful spending cuts? Democratic and Republican lawmakers returned to work today and they've got a big deadline looming. 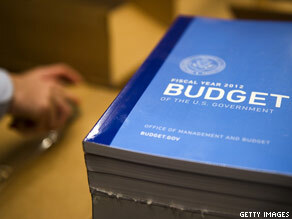 President Obama unveiled his 2012 budget earlier this month. If Congress doesn't reach an agreement on spending cuts by Friday, the government will face a shutdown for the first time in 15 years. The House already approved $61 billion in spending cuts in a measure passed earlier this month, but Senate Democrats have said that the proposed cuts go too far and that they will not vote in favor of them. So the Republicans have proposed an interim spending plan that would give Congress a two-week extension. It would involve just $4 billion in cuts and would keep the government funded until March 18. I wonder if they'll ever stop playing games and actually address our country's fiscal condition in a serious way. Our national debt has now surpassed $14 trillion - a staggering sum that will never be repaid. And every day the government refuses to do anything about it, it just gets larger. We are bankrupt. This weekend, Speaker of the House John Boehner called the national debt a "moral threat" to this country and said people "better start praying." It will take more than prayers. It will take guts… the kind being displayed by people like the governors of Wisconsin and New Jersey. Here’s my question to you: Do you think the federal government will ever agree to meaningful cuts in spending? Since "meaningful" cuts mean cutting the grossly obese Defense Department budget, it'd be a very brave politician to ever call for that kind of discipline. Defense, agricultural and energy 'support' payments, and a sensible approach to Medicare and Medicaid (starting with really cracking down on fraud). Those are the cuts we need. We'll not see them soon. The short answer is, "Not if they want to get re-elected." The Tea Party talks a good enough game about "common sense spending cuts" to get elected, but they never mentioned any specifics during the 2010 campaign. Because any specific cuts would have cost them the votes of the constituency dependent on that government program. I think we've had this conversation. The answer is only at the point of the whole world unraveling will they do anything. They don’t care. They’re all millionaires, and it makes them feel important. A divided country keeps them in power and us powerless to do anything meaningful about it. We actually have very little control over anything or anybody. Jack, the real 'guts' won't be about budget cutting; it will be about changing some pre-conceived notions. We don't have a chance without an overhaul of the tax codes, a re-ordering of what National Defense really means, and a willingness to deal with the vastly different actuarial realities that have tanked Social Security and Medicare. We're not just broke... we're in total denial. Democrats say 61 billion is to much. Republicans say 61 billion is not enough. The problem is that neither is willing to compromise. Like Moammar Gadhafi, they think the people love them. Not as long as there is still space between their backs and the wall! I wonder why the question is never "Will the government and the people ever realize that we can't continue to cut taxes at every turn, including on the richest people in our country, and still fund the things we need?" Mr. Cafferty : The day pigs start flying , will be the day the federal government will agree on meaningful spending! there will be no pork cut. Our goverment has 467 people who love there money and will not do any good for the american people. All they do is lie about what will happen if the govermnt shut down. both partys are to blame and this group will never do any good for us. Next election vote them all out and bring in american people not the jerks we have now. Do not listen to ther lie's or what they will do to fix the problem. Both partys have failed us for the last 40 years. Jack: The easy answer is no, but nothing is easy to cut in the federal spending arena. The population wants soical security, medicare, and medicaid left alone by more than a 2 to 1 margrin. Democrats like these programs because they were their ideas, but Republicans do not like social security, medicare, and mediaid. The Republicans state they would not reduce anyone who is over 55 years of age. This means all people under 55 are about to get screwed. When the lights go out in DC, yes. Of course not. They live too high on the hog.....and they intend to milk that for everything it is worth! They will at the 12th hrs.....USA is headed for terrible times and the poor kids what they will be saddled with. This Pres will go down in history as one they will want to remove from the list for all the "stupid" money he has spent. Read last week about the 1/2 billion dollars to a green company that took the money, shut down he plants, and used the money to move to China. That is just one of over 100 we have read that were idiotic projects. Yes, I said someone is very stupid or wants damge to America. No. The almighty dollar means power. Not if they think doing so will make them un-electable next cycle – that's the sad reality of it. If they agree to cut the things that need to be part of meaningful cuts – they will be painted by the special interest political ads as heartless, or weak on defense depending where they cut. Anyone for campaign advertising reform????? No. The vast majority of Congressmen and Presidents are all too convinced that they can manage an economy and our lives, and will drain our wallets and spirits dry. The markets will eventually demand higher interest be paid on the debt, and government will be forced to either shrink or speed up the printing presses. Which do you think they are more likely to do? They'll agree to meaningful spending cuts, but they won't agree to meaningful tax increases on the wealthy. Both are necessary to solve the financial mess we're in, so we'll still end up with the mess when all is said and done. Eventually they will have to, but with the economy just beginning to recover from the Great Recession, now is not the time. They may have no choice since they'll have to counteract all the meaningless tax cuts. The top 2% are going to need all the money they can get to build all the moats and drawbridges they'll need to keep us peasants out once corporate fuedalism kicks into full gear. Terry- Greensburg, IN "Hoosier Hillbilly"
IT's a "DO"! or "DIE"! situation this year – NOW!!!! But I've lost confidence in our government to make the right decisions. They are ssss;so" biased in so many ways looking out only for themselves and getting re-elected I don't feel they have the public's best interest @ heart. They've turned into " do what's right for me " people like most of the rest of this Nation and couldn't give a damn about anything else. As a "Nation" "WE" need some drastic measures taken to get the ship on the right course and until we can get to two major parties to oar together it will never happen. Only when the Democrats lose the Senate and the White House in 2012. Short answer - not in my lifetime. But then, I'm 75 years old. What comes after a trillion Jack? Given the current political climate, the congress and administration is incapable of making meaningful and helpful budget cuts. I think the only way that could happen is if President Obama put an emergency freeze on all federal appointed and elected official's salaries, benefits and entitlement until a plan was worked out was worked out and passed a national referendum. And of course that will happen when pigs fly. Will the federal government ever agree to meaningful spending cuts? Heck no Jack. The bigger question is, will CNN ever agree Now or Never to STOP the meaningless cuts in your airtime? One mans pork is another mans bacon Jack. Politicians make so many promises trying to get elected that there will always be wasteful spending in government. In fact the government has mastered the art of wasteful spending with committees designed to investigate committees. One of the most egregious wastes we heard very little about was in 2003 where in the Treasury Report in a tiny section it mentions "Unaccounted for Transactions". This amount was 25 billion dollars and to this day it is still unaccounted for. Someone needs to be watching the government a whole hell of a lot closer then what is currently being done. They probably will. They will take away good schools, medical care and food for the poor, good paying jobs for the average person. While the rich get richer with the massive tax cuts they will get, you know the tax cuts they really need. Meaningful to who, Jack? To the 2% who will immediately convert the savings into tax cuts and start crying poor all over? The greed in this country is breath-taking. Until we start collecting taxes fairly again we'll never survive. Period. Only after it's too late. Some people say we need to end the wars but our economy runs on war and the Republicans thrive on it. We are in very serious trouble in this country and need to stop the bleeding. TAMPA, FL you, bet! the day that china and every other country cuts our politicians credit off. reality, what a concept! Not yet. Our Politicians will never change. They will react to late, and wait till the crisis has come to react. By the time they decide NOT to cut spending it will be too late, for there will be no money to spend. Jack when you bring up spending cuts and balancing the budget you never mention the highest 2% income in America paying the same tax rate as a person making 300,000 dollars. I am willing as I am sure many others are to sacrificed and pay more to balance the budget. I don't even make near $100,000. I am still willing to eat hot dogs and beans even on a smaller plate. I never hear anything about the highest 2% income paying their fair share or willing to give up anything. I haven't heard the governor of Wisconsin willing to work for less and pay more for his Health Care and retirement plan. These people are hypocrites and we all know it down here where the people suffer the most. When Congress and state governments gets honest with themselves, stop protecting the rich and agrees to suffer along with the rest of us to balance the budgets. Then and only then we might be able to do something about the deficits. Not as long a our politicians are bought and paid for with corporate money. I don't mean just Republicans either. As long as there is at least one lobbyist in Washington, there will never be meaningful cuts. And let's not get meaningful confused with stupid. Washington is by nature a self-serving beast and their idea of meaningful has nothing to do with reality, practicality or common sense. That is why you will never see anything cut that would interfere with their personal wealth. No Jack. I say this because the government has no clue to meaningful budgets and responsibility. What we have are political hacks who have no clue as to how to balance anything. The complete budget needs to be addressed and that includes Medicare and Social Security. We also need to reduce military spending and stop trying to be the world police. But none of this will happen and the president will continue to live in his fairy tale world while the middle class crushes. The Republicans gave a tax break to the upper "two" of the United States, and now they're crying that we're broke?! Maybe instead of hating the teachers of our country and blaming them for "our' financial mess that we our in. The Republican'ts should all go back to high school for a Civics lesson. Oh ya, I forgot, it was cut do to budget restraints. The damn middle class, costs way too much! No. The cuts would have to come from the military and they would have to be monstrously large cuts. That would mean the war profiteers would watch their haul of taxpayer dollars decrease and they, in turn, would stop writing checks to politicians. It's so much easier to target the poor people who can't buy anyone off. So long as the military industrial complex maintains its control over politiciians there will never be any meaningful budget cuts. Trimming the sacred entitlements–Social Security, Medicare and Medicaid–although a necessary evil to fiscal survival, would be akin to telling the emporer he has no clothes. Ironically, the emporer in this scenerio is us, and if we don't open our eyes to reality, but quick, we're going to fall on our you-know-whats. No. The current federal government seems to only seek out unmeaningful cuts, that will hurt many people and may well cripple what is left of the middle class. It appears to be an every man/woman for themself mentality. What a sad commentary of the world today. The real question is, "Will congress ever agree to meaningful spending cuts." The short answer is, "Not if they want to get re-elected." The Tea Party talks a good enough about "common sense spending cuts" to get elected, but they NEVER mentioned any specifics during the 2010 campaign. Because any specific cuts would have cost them the votes of the constituency dependent on that government program. That question should go to the Republicans; as to whether they are really serious about cutting the Federal debt or they are just using it to their political advantage? It worked well for them the last election. They think may be it would work well for them again this time around. Will the federal government spending ever be meaningful ? No. The Democrats believe in social programs that keep order by preventing extreme poverty and the Republicans believe world Empire though massive military spending. Both cost a ton of money. Even if you eliminated one of them, the other would still cost too much money. Of course the answer is to increase taxes, particularly on corporate incomes, but since they purchased our government long ago they will simply continue to take from us until the bottom drops and there is blood in the streets. Since "meaningful" cuts mean cutting the grossly obese Defense Department budget, it'd be a very brave politician to ever call for that kind of discipline. Defense, agricultural and energy 'support' payments, and a sensible approach to Medicare and Medicaid (starting with really cracking down on fraud) - those are the cuts we need. We'll not see them soon, alas. The Republican't (Republican+T) Party will see to that, aided by their corporate owners. And, since spending cuts will make the recovery that much harder, and a recovering economy helps President Obama, we're really, really, really sure not to see anything "meaningful" offered, agreed to, or even countenanced by the Republican'ts. Just not going to happen. Probably not in any significant way. Most government spending translates into paychecks for employees, paychecks for consultants and support the payrolls of suppliers of all products and services used by government. As politicians see it, spending equals jobs – and that is priority #1! Not until we elect enough Constitutionalist to stop both the Republicans and Democrats from printing money! The gold standard needs to be reinstated and this government needs to be paid by merit, and statistical accomplishments; and not paid if they fail at keeping things at an even affluent ascent! No more rollercoaster or wasteful budgets! Congress not cutting spending is not an option. Failure to heed the mandate of November 2 will make the election in 2012 a slaughter. Nope. Our system is broken. These elected officials are only looking at how to get re-elected. Our parties will continue to clash. Our debt will continue to grow. I hope these newly developing democracies are taking note. George Washington was right: a two party system is bad for demcoracy. Jack,not as long as their main job is to be re-elected! For all the Bush bashing, the deficits were shrinking during his term. Unfortunately, a combination of economic turmoil and Democratic propensity to spend (which plays into Republicans willingness to join in a free-for-all), the only impetus to either party is the Tea Party, and the threat that they will all get voted out. So, yes, there is the possibility of meaningful cuts, it is just a question of continued pressure to highlight the wasteful spending. Maybe you can help Jack, and point out the realy wasteful stuff. Under the current administration, no of course not. I don't know but it could easily be done. Eliminate all government agencies with the exception of those considered essential to operate. That's what happens when they implement the so-call government shutdown. Many agencies are doing nothing but shuffling papers and duplicating services. For example we have the U. S. Department of Natural Resources and Conservation as well as at the state level we have the Georgia Department of Natural Resources and Conservation. Get it??? not when the lobbyist pay off the democrats and the republicans who subsidize our demise as a country and culture, while playing internationaliist who foolishly capitulate our future for the wants of staying in power regardless of good or bad...purge the sellouts!!! stop the giving tax breaks to hedge funds and capital gains tax breaks that comefrom the workers getting cheated out of a liveable salary.. What?, and bite the hand that feeds these guys. The Democrats and Republicans are willing to cut spending on programs that do not funnel funds into their coffers from their backers but reluctant or opposed to meaningful cuts for programs that benefit themselves and their friends. I don't belong to either party so I wont ever benefit from whichever bunch is in charge. In a word, NO! The morons running the federal government will never actually do the job they are elected for, their egos are too big. Too bad they aren't like the rest of us poor slobs, who would lose their jobs if we didn't perform. I think we've had this conversation. The answer is only at the point of the whole world unraveling will they do anything. They don"t care, their all MILLIONAIRES, and it makes them feel important . A divided country keeps them in power and us powerless to do anything meaningful about it. We actually have very little control over anything of anybody..
Of course not. But your remark, Jack about states like Wisc–Budget cuts seem to always address Social Issues–THE POOR–and never the upper income folks. Wisc budget cuts do not need to sell power companies to the first buyer nor do collective bargaining rights have anything to do with cuts to employee benefits. Shame on you! Will the federal government ever redirect foreign aid to home aid? How can we justify subsidizing anything other than the situation at home? I suspect that those few that profit through those subsidizations will still profit through the exploitation they enjoy at home. No it probably will not. The federal government is of the elite, by the elite and FOR the elite. The real 'guts' won't be about budget cutting; it will be about changing some pre-conceived notions. We don't have a chance without an overhaul of the tax codes, a re-ordering of what National Defense really means, and a willingness to deal with the vastly different actuarial realities that have tanked Social Security and Medicare. We're not just broke ... we're in total denial. we will not see a change until we change the faces in d.c. The idea of meaningful budget cuts exists only for the sound bites the subject creates during election campaigns. To attain meaningful cuts the government must start the process to completely reorganize itself. It can be readily observed in the private sector, when a company gets in far over its head, the first action is to redefine itself, define substantive long term and short term goals. Bottom line, the federal government and all of its agencies must be reinvented. A new structure is needed to move us forward into the 19th and maybe 20th century, the 21st century will still take a lot more work. Meaningful cuts will occur when the people in charge start to make meaningful decisions based on a clearly defined vision. America has lost its vision. Debt a "moral threat" ? How can anyone in Congress talk about morality? They give Billions to a corrupt Karzai, yet let middle class American families lose their job, home and have to live in a car. That may be getting serious about cuts, but it's the wrong cuts and it's immoral. If by, "meaningful" you're talking about Boehner and Cantor relenting on the ridiculous pork of a duplicate fighter engine when the Pentagon is begging them to cut the waste, don't hold your breath. In a word no. Jack we are run by a bunch of gutless cowards who may have good intentions but only push for things they think will pass, instead of what is right. Even 61 Billion is a drop in the bucket of the current defict we are running. It would take massive cuts to scale back spending to a sustainable level and repay the debt. We need people in Congress and the White House who care more about America than re-election and that is not the sort we have. We have the kind of people who talk of Hope but fail to push any policies that would actually foster hope. All I hear is more "investment" ideas, read "spending". The federal "government" could care less if they ever come up with "meaningful" spending cuts. All the men and women in congress care about is serving enough time so that they can get their cushy retirement and full paid medical when they "retire" from "representing" their constituents. The GOP thinks that they were elected because the voters wanted their brand of governing (which is my-way-or-the-highway). The Democrats don't seem to have any methodology for governing since all the do is waffle on everything. If the federal "government" really meant to cut the debt they would be talking about the entitlement programs, but you will never hear any of them, GOP or Democrat, call for cuts in social security, medicare or medicade. There are barely any calls for cuts in the bloated defense budget. I hold no hope for this country any longer. Jack with the current leaders we have we will never see any meaningful change in our government at all. They are both too caught up in their own special interests to do what is best for this country. We need a 3rd party, a moderate party that speaks for the Average American that is not a part of this polarized mess that is our Political system. As long as there is a divided congress there will be no meaningful spending cuts. Each party wants to cut something different. Wars in Iraq and Afghanistan together with acting as policeman in foreign problematic countries does not augur well for reduction of the country's debt. It is amazing that reference is never made as to the monies spent in a needless Iraq war. Is it not time for the policeman's responsibilities to be shared by NATO , Europe, Africa , Russia and China. All those parties have an obligation. The U.N. and the Security Council cannot be relied upon to act responsibly given the different factions and tribal instincts and they will not change so long as your country always dons the mantle of responsibility for the world's ills. "GUTS" like the ones being displayed by the governors of Wisconsin and New Jersey, Jack? what kind of "GUTS" does it take to give TAX CUTS to multi-millionairs at the expense of public sector employees and state social programs? same with the Federal govenment. they extend the Bush tax rates which will balloon the deficit by trillions of dollars and want to STEAL Social Security and Medicare from seniors, who paid into those programs their whole working lives to make up the short fall. that's WHY Social Security and Medicare are called ENTITLEMENTS, Jack. people payed INTO them and are INTITLED to at least get PAYED BACK. you want to balance the Federal budget, or at least slow down the debt expansion, you need to go back to the pre-Bush tax rates AND it wouldn't hurt to GET the HELL OUT of BOTH Iraq AND Afghanistan. how many BILLIONS a month has THAT foolishness cost us? The house speaker is not the only one pointing to a "moral threat". has promised so hard to work for/ Instead they are hell bent to remove Obama from office ASAP.It appears that the DEMS have more heart for the working public than any body else.. The only time the federal government will effectively cut spending is when there is no more money and no more lines of credit to pay for it’s extravagant but unnecessary military weapons systems, tax cuts for the super wealthy and corporate welfare, i.e. when we run completely dry. That would be long after they eliminate what they didn’t yet steal from Social Security. What no one is willing to address is that all the proposed fixes for SS have been in effect for decades now – there is nothing left to take from it. All SS recipients have been robbed and further pounding them into the ground will not solve the problem. It is time to make those who raided the SS trust fund pay it back. It is time to make the super wealthy pay for the free ride the rest of us gave and continue to give them on our backs. It is time to make big business and the insurance and financial industries pay their share and stop giving them bailouts, welfare, and huge tax breaks. They are the only ones with any money left and it is time for them to give back. The rest of us have given back more than we can afford. But it won’t happen, the gutless wonders in government will bring us down with a splat at the bottom of the cesspool. Jack, I don't think that significant spending cuts will ever be instituted until Americans march in the streets like in Egypt and Tunisia. These peckerheads in the senate are only interested in one thing and one thing only.........getting re-elected. Most of them have already sold their souls to the special interests by the time they're elected that they have forgotten those average americans that voted them into office. The nation is now owned by big business and the wealthy and they view the average american as a serf or vassel to them. If a true democratic form of government is ever achieved in this country again, the people are going to have to be so ticked off that they're willing to take to the streets again. Will they? Who knows, but I doubt it without a leader. I believe that cuts are merely the flavor of the day. And that cuts will not get done what needs to be done. What is needed is to look how the money is being used and then use that money in the most efficient means that will bring in the most revenue. So you see, it may not be we are spending to much money but not spending it wisely. They All Need To Do What's Right, Make Cuts Where Neccessary And Stop Spending That Is The Right And Just Way To Balancing The Budget. All These Democratic Wisconsin State Lawmakers Running Away Is Wrong-Return To The Job You Were Elected To Do Wisconsin Lawmakers And To Washington Enough Is Enough Let's All Work Together To Balance Our National Debt! As the American middle class private sector production worker has taken it in the shorts, by contrast the organized public sector workers have been better able to protect themselves than the private sector workers. Is it because the organized public sector workers are smarter? No, it's because for the most part public sector jobs are “service” type jobs, ie. Police, fire, teachers etc., jobs which cannot readily be shipped off the communist Chinese. So there real question is not whether public sector workers should loose their rights but what can we do to give increased protections to private sector workers? During the last two years Labor unions have been disrupting the day to day work inckuding teaching. It is very sad that these employees who get maximum benefits from rax payers who are losing jobs and benefits. The strikes which are common in third waorld countries are now rampant especially during the last two years. It is hightime that the taxpayers who support these union employees are also given some consideration. Meaningful cuts? Meaningful to whom? Someones gotta pay. Maybe Congress and the Administration should all take pay and benefit cuts to set a good example. In a word... no. Repubs want to cut taxes on the rich and let the poor pay for it by cutting Social Security, Medicare, and education. Dems want to cut spending in some limited areas, but don't seem to want to address taxes. The solution – raise taxes. Not on the poor, but a little for the middle class and a lot on the rich. They benefited for years under Bush, it's time to pay up. History has shown it will not hurt jobs. Cut spending on pork barrel programs and put the money where it's needed. Cut defense spending – the military has said they could take a major cut without it hurting them, why don't we take them up on that. It will take years or even decades to reduce the debt to a manageable level. But we have to start. No they will not. The problem is too many bloated agencies filled with people commanding bloated salaries and corporate executives with politicians in their pocket syphoning off taxpayerr funds. The only solution to our problem is to downsize government significantly but you can't expect them to lay themselves off without being forced to by "we the people". If we don't drastically reduce government anything we do will be for show only. We will then have to learn how to live under a new form of government and economic system; not exactly new, but new to America. Not until we get more informed and active voters (not holding my breath for that). For every 1 vote a congressman gains from a conscientious citizen who's happy that he's making serious cuts, he loses 10 votes from people who are mad that he's cutting THEIR funding. Everyone always wants sacrifices until they have to sacrifice something. As for THIS government condering cuts in spending: it all depends on whether the cuts are the pension and benefits I earned over the 55 years I worked (YES) or continued support for the rich (NO). You might figure out where I stand. Give me a break, "moral threat", no problem borrowing the money from China and having two wars that killed many young Americans and civlians in Iraq and Afganistan. But we have to fight the "moral threat" here with cuts in education, food stamps and anything else that doesn't benefit the rich. I heard today on a liberal radio program that Exxon and Bank of America paid no income taxes whatsoever last year, how about that "moral threat"? Time is running out on this country and I think it has expired for the middle class. So sad. They should, however, the easiest and fastest way to cut spending is to stop the funding for the unlawful wars that we were hood-winked into by the Bush Administration. This should be done immediately and all our military personnel brought home NOW. There is no reason to cut other spending because the money that has been spent on these two wars and is still being spent would be more than enough to get us back on a financial upswing NOW. President Obama and the Congress had better stop playing political games and start working together to reach a reasonable budget deal to avert a possible shut down of the federal government. The last government shut down had disasterous economic and political consequences for political leaders and for the country. A government shut down could forestal a economic recovery, trigger another recession and doom the Democrats' political fortunes for 2012. The stakes are high for everyone and there is no room for gamesmanship and foolishness. The country needs adult leadership and needs it now. The pay and perk cuts should start at the White House, and continue right to every Congressman, Senator, President. Nevermind Lybia's corrupt leader. We have enough of our own corrupt leaders. It's long ovwer due that our own Bottom Feeders needs and should feel the economic pain, don't you think Jack? Jack, don't let the governor of NJ fool you! Sure, there have been cuts but they are at the expense of the people who can least afford it! Millionaire tax has been removed, public safety is dangerously at risk, education is grossly underfunded in the poorest areas. Furthermore, taxes which are already the highest in the nation have not been cut but fees have been added! The fees truly burden our seniors who cannot afford their higher fees for prescriptions! There is NO sharing the pain! Meanwhile the governor continues to employ personal aides for his wife who is not disabled while seniors lose their homes! our military is in two wars and extended one of them not taking into consideration we have no money. No they don't care, As long as there pocket's are not empty. Jack, I don't believe they will fix anything. There all trying to get as much money as they can before the inevitable collapse of our infrastucture. However I for one welcome our new chinese overlords. They seem to be better at handling money than ours do and if thats what its going to take then china can have our government. They say President Lincoln once walked three miles to pay back a penny. That makes him the last politician to do anything about the national debt. We can't do anything meaningful as we no longer own our country. The owners are the foreign countries that have bought our treasury bonds and picked up our national debt. Ask them. Absolutely! But do it after economic recovery in a meanful way. Than you'll have the revenue from a stronger recovery and less out-go for welfare, unemployment, food stamps, etc. Balance the budget over the business (economic) cycle. The economy runs from boom to bust over a 3-to-8 year cycle...balance over this cycle. Annual federal busgets are an "accounting" cycle and if you balance on an accounting cycle you cut during recessions, over spend during booms (causes inflation and kills recovery). This is why the politicians can't balance the budget. What I find more interesting is that deficits are the most important thing EVER only when there's a Democrat in the White House, never when a Republican occupies it. the sad answer is no jack. Everyone on capital hill owes too much allegiance to their corporate owners. Big oil and big farming will continue there billions in subsities. while we gloat at the site of teachers and other public union people finally get whats coming to them? Only 4 % of the work force is public unions. How have we allowed the republicans to make them enemy #1.
were heading to the crapper jack. and we elected them! No, the federal government will never agree to needed budget cuts until we start electing people who are more concerned with serving than being re-elected. There are plenty of huge cuts that can be made – oil company subsidies, unnecessary Pentagon programs, tax subsidies for companies that send our jobs overseas, closing tax loopholes for multi-nationals, deporting illegal workers who don't pay taxes while sucking up entitlements, etc. Unfortunately, nobody in Washington has the stones to make them. When pigs fly there's going to be no agreeing with each other until after the 2012 election when we have a new president . Obama isn't going to allow government spending to be cut. Obama like other Socialist Democrats including Bill Clinton, believes that he can spend our money better than we can. "This weekend, Speaker of the House John Boehner called the national debt a "moral threat" to this country and said people "better start praying." It will take more than prayers. It will take guts… the kind being displayed by people like the governors of Wisconsin and New Jersey." You think being on the payroll of the koch brothers to destroy workers' rights takes GUTS? That says a LOT about you. You don't even FEIGN impartiality anymore. You are just another republican cnn corporate shill. You and your "Cafferty File" bs can go straight to hell. Only when the public demands they do. That doesn't seem to be in the immediate future as private individual spending and personal debt is normal for too many. It has been a way of life for so long it appears personal debt from borrowing and spending is required. We have indeed become slaves to the marketplace. Closer to home they don't seem to be worried about their kids and their grandkids like the politicians keep reminding us. No. They will spend too much time debating the word "meaningful" to solve anything about the budget. not as long as the united states is one country! too many people in the house and senate need each other to get their agendas through and can't risk p/offing possible voters from other states. the only way to cut costs is to have the united states become individual states/countrys. our government is becoming close to unnecessary. the only way to have the real cuts we need is to have a government for the peolpe and not for themselves. Our leaders will only do whats needed if it guarantees them a successful re-election! Very sad, because it is us that puts them into power. No, he will never agree because he has a hidden agenda that none of the regular people know about. The Republicans controlled congress for 8 years before Obama. After dragging the U.S. into an unfounded and non-funded war and cut taxes (which did not grow the economy), they still have no answers, which is no shocker. If they had their way, we would have had a deep depression rather than a recession. "It will take more than prayers. It will take guts… the kind being displayed by people like the governors of Wisconsin and New Jersey." Guts? You think being on the Koch payroll takes guts? Let me tell you what takes guts.. being willing to give up your paycheck for your principles..being willing to be separated from your family takes guts.. If you had a point to make.. you lost me with that.. Wisconsin leader has guts..
no, never. they have no guts....no one wants to take responsibility as they will lose re-election votes no matter how they vote. their only concern is to get re-elected. they are gutless wonders...and we vote them in !! who's the dummy here? Meaningful cuts ? Nope.. Congress is afraid to take on the biggies, Social Security and Medicare because to do so will most likely result in political suicide. As allways we are experiencing government by crisis. Our leaders only had 60 years or so to plan for the retiring baby boomers.. they kept kicking the can down the road, now that can has hit the curb on a dead end street. How about modifying the tax code so that someone making 50million doesn't pay the same amount as someone else making 50thousand dollars. Maybe THEN, the US will have enough revenue and wont find the need to blame deficits on teachers and middle class families or cut and slash services being provided to the poor. Are you kidding me ! CUT, CUT ! I don't no if you got the memo but we are about to take military action in Libya . I have traded all my dollars into Euros and British Pounds. No, Jack, I do not believe either side will look beyond the next election , they are too busy playing Politics with our lives. And the Governors in Wisconcin and New Jersey are no different, each has his own agenda and its NOT for the good of the people rather, it is for the good of the Tea Party and we all know that the Tea Party is being funded by the super rich Koch brothers among others. Jack, do you realize that when these spending cuts are made, PEOPLE lose their job? Get real, there has to be a balance. Obviously you are not a Union member if you agree with these Republican Thugs. Union people shed blood , sweat and tears to achieve Collective bargaining. Why don't you give up half your salary?? C'mon Jack, put your big bucks where your mouth is. Budget cuts are deflatinay, meaning that the pudh the economy toward depression. Since we are already in a depression, we need to approcah budget cut carefully – mayby a balanced budget over 12 years. Obamaas budget already propoed significant cuts from 2010. Again, be careful what you wish for it could be catastrophic. According to the fiscal financial advisory board, any spending cuts in excess over a certain amount will bring a more economic recession. I don't think that the Republican House of Representatives actually cared about making those 61 billion dollar cuts based on how they voted on all the amendments. After all, they did go through 500 amendments of the budget in a matter of two days. Come on Jack, it's revenue that's the problem. George W. Bush increased the deficit more than all the previous President's put together and gave the money to his rich Repubican friends. Increase taxes and balance the budget, don't blame this on the middle class. Ask Wold, who fife minutes ago in rsponse to the question "can we act unilaterally in Libya"? answered "of course, we're the superpower and we can do whatever we want". Well, if we can do whatever we want how come our states are broke, and we are not creating jobs? Cutting teachers is not the answer. We need to listen to Ron Paul and others like him, and abandon these ridiculous Empire dreams that we can't afford anymore. We can support 11 carriers two endless wars and more than 700 military bases abroad, but we can not afford decent pensions for our public employees. Some superpower. In a word... No. For every budget cut, there's a reason to keep it. For every spending bill, there's a reason to cut it. Someday, the country and the rest of the world will wake up and realize that our money isn't worth the paper its printed on. As long as our do-nothing Congress acts only for themselves and not for the people in general, we will never reduce our debt. How can a Congressperson give themselves a raise AND at the same time deny our senior citizens a cost of living raise for TWO YEARS?!! They know what needs to be done, but because of what I would like to refer to as childish foolishness, self interest and obsolete party politics, no meaningful headway is made. Let them live like US, at our salary levels, without their living benefits (that they do NOT deserve!! ), and see how long things remain the way they are... With the threat of a bankrupt and corrupt nation as their legacy. In a nutshell, they are an embarrassment! Jack - Tell Congress to use the 30 Billion dollars of Gadafi's frozen assets to pay down the deficit - it's a start in the right direction. Oh, thats right ,defense contractors paid for their campaign expenses. Military adventurisim and carte blanche spending on weapons by the GOP has caused the deficit. Of course we won't, I think Term Limits would answer most of the problems we have with our politicians. There in for 15-30, etc years and they lose touch with real people who have real problems, take money from Unions, Big Business, continue earmarks, all in the name of representing their voters!!!!!! Shameful!!! Not a chance! Government has lost the ability to fix government. Are you kidding? They will not be meaningful addressed as long as law makers have a chance of getting re-elected. Careerism is first and foremost for some of these people. If a law maker renegs on a campaign promise that should be fraud or treated as a felony and then maybe things may have a chance of moving in the right direction. Until that happens, the politicians want to just be politicians again at any cost. People vote and we elect people and as soon as the person elected does something people do not like, they start calling for a removal or effectively a "do over". Look at Wisconsin and Florida. People calling for the Governor's removal. Horray for the politicians making the tough calls they said they would make while campaigning. To do anything less is a crime and a fraud. Chuck M. La Garita CO.
salary and benefits. This they will never do, and they do not have too. They are in the pocket of big business, the largest "protector" in the world. The lion's share of the budget goes to the US military and we are spending over 300 million per day in Afghanistan alone. No one can tell you why we are there, what we are trying to do, or whether we are accomplishing anything other than killing innocents. The useless wars may feed the war machine and the military industrial complex but they are bankrupting the country, and yet no one proposes a meaningful cut in military spending. Congress is made up of 435 prostitutes who have sold themselves to the corporations who make billions while draining the economy. Long live the Empire!! An independent economic analysis that was released today (Moody's )claims that the GOP budget cuts would rsult in a loss of 700,000 jobs.A Goldman-Sachsanalysis said the same thing. Looks like the GOP finally has a jobs plan; too bad it's a plan to KILLL jobs. Yes Jack, they will eventually. They both know what needs to happen, they are just jockeying to avoid being first to propose the steps necessary. They are politicians. Politicians avoid direct responsibility on anything, unless and until, it turns out to be popular. Guts? Cutting programs for the working class and poorest people in our society while defending the tax cuts for the richest!? Yea that takes a lot of guts. It'll never happen. Neither major party is willing to sacrifice the chance to further their agendas or the political capital to do it. It'd take a leader willing to cut spending while raising taxes with no regard to our position in the world. It would be a legacy of vitriol and enmity from anyone who had to suffer, which is to say everyone. No one wants that job and no one wants to bite that bullet. The need for cuts is borne of denial that the real culprit in our capitalist society is the lack of equitable taxable income for ALL the people, not just the middle class. A shrinking middle class cannot continue to finance a changing demographic of non-taxable poor and tax-avoiding rich. Fix the tax code and the deficit will fix itself. Your asking the wrong question, Jack. How's this one: Will the Democrats cut spending on critical programs that they fought tooth and nail for so that the Republicans can continue ruining our country with trillion dollar unnecessary wars and tax cuts for the wealthy at the worst possible time? Here's another: Must we keep a straight face as the Republicans fight to derail the Democrats realistic attempts to FIX the fiscal situation by FIXING healthcare, then rant about the deficit. You have GOT to be kidding? The entitlement programs that impact the deficit, i.e. Medicaid and Medicare are contributing to the deficit BECAUSE of rising healthcare costs. Fix the problem? No! The Republicans are protecting their one true entitlement program: the transfer of wealth to the rich from the middle class!!!!! No. Obama has aways wanted to see the collapse of the United States. It's his version of the American dream. When he took office, the national debt was 7 trillion and in less than 2 years in office, he has already DOUBLED the debt. Imagin how many families are going to die because of his plans! Mr. Cafferty, love your blog. Yes, I do believe the federal government will eventually agree to meaningful spending cuts. This, however, cannot be done overnight. The only way to do it is by making cuts where the Republicans can's say in political ads "the Democrats cut this" and the Democrats can't say in their ads "the Republicans cut that". If they want, I have a very good accountant who could help them out tremendously. She has the common sense most politicians somehow forget the second they get elected.. Yes, Jack, meaningful cuts will happen but not on your terms, Jack. There is plenty to go round, but a lot of it will have to come from the likes of you, Jack, and me. It's not sacrifice, it's giving from a sense of enough and plenty, which you and I have more than most. So step up to the task and give from your plenty and urge others to do the same. If that means higher taxes – say YES to that! is when the Republicans end the tax cuts for the wealthy and end the corporate welfare that gets them elected! I find it curious that when the WI. 14 took a hike that Repubs said "those folks should be at their jobs." Yet they toy with the idea (&therefore us) of shutting down D.C. If our elected officials are serious about cutting back on spending, then why not start with a freeze on all foreign aid, at least for a period of one year. Reallocate the foreign aid funds to meeting our nation’s current immediate needs such as preventing a shutdown of the federal government or negatively impacting our senior citizens well deserved entitlements. If nothing else, it should facilitate a short window for our so called “leaders” to actually begin to do something that mirrors their fiduciary and stewardship responsibilities to those who have elected them, instead of what is popular with their lobbyist groups in getting them re-elected. Not if it doesn't profit them. I know it wouldn't help the budget much but if the Congress and Senate would work for a dollar a year until the debt is paid off. I'll betcha! we would have a balanced budget sooner than later. I wish the speaker of the house could remember that this debt was created by his party and that it was his president that went to war in the wrong country, with out a war tax, instead passing it on to our grandchildren. They will agree as soon as the majority, not the rich, create a party of their own and expel the career criminals that exist in our government . Not until a balanced budget ammendment is passed that makes it a crime for congress to pass an unbalanced budget except for limited, carefully defined circumstances. What do you mean by meaningful? Is is meaningful to cut education, health care, public radio/tv, and other programs to support the citizens of this country, who pay their fair share of taxes, while protecting the rich and the corporations who use every loop hole to reduce their already low share of tax, so that many don't end up paying any, and boost huge profits to boot? The priorities of the government are all wrong, but clearly still controled by the lobbyists, corporations, and the good ole boys of Washington. How about imposing tax or penalities on the corporations that continue to ship our jobs overseas to pay low wages and increase their profit margin. The government will reduce the deficit greatly by dealing with that. Jobs will not return to this country until that is addressed. Meaningful cuts yes, but that is not what the House proposed. I have not heard lately that they are willing to take pay cuts, or reduce their insurance. They can stand up there in Washington and talk about government cuts, but the main stream of the cuts are for our poorest of society, their medical needs, their food needs, but the congress go home with monies in their pockets every pay day, and a lot more then teachers make, their families are insured and their retirement future is full of certainties, not like the middle and lower class American, which all have uncertainties. They have made it so that they cannot take pay cuts, so the fat calves sit and bicker how to make our lives more uncertain and more miserable by taking more away. The middle American did not cause this debt, the governement did and in the past eight years, so why do we have to take the cuts? Most go to Wa with good intentions but the old heads get hold of them. They soon learn that the unwritten rules won't let them do anything without the approval of those in charge. If they try they are dead in the water. As a result we just keep going deeper and deeper in debt. The gov will never make proper budget cuts do to the fact what needs to be cut is administrative paychecks. the question is how much do we pay the admin? I am willing to bet most of our budget pays there salary. How maney MILLIONS do we spend every Year to make Sure they are over paid? If we re examine the pay roll budget and pay the admin a resonable salary so they can live comfortabley I guarantee well will decrease the budget over night. How much do we pay Ex-Presidents in retirement? How much do we pay the supreme court? How much do we pay the White House staff? These are the Question the american people need to be asking. You are talking about the federal government of the USA right? Most of us bloggers on the Cafferty file know this is not a trick question. So, here goes. Only when the "government" sees the ship of state's bow go under the waves will they wake up and be the "deciders". At that time they will throw your life jackets overboard to lighten the load. Look at Wisconsin, the Republican Gov Walker came into office with a projected 120+ million dollar surplus. A SURPLUS. Why did he have to give those huge tax cuts to corporations in WI to bring his projected budget to a 120+ million dollar deficit! Why? Then he goes after the public workers in WI. Where is his focus? He could have worked with the public workers in this economy. To put his state in this kind of chaos is all on his shoulders. No excuse. You ask, can our Congress get real about spending, No, its our government officials that are "delusional". Just so you know, I am a long standing Republican. Congress won't get serious as long as the elephant in the room is ignored. Corporate money calls the shots. Why is 88% of the budget is off limits for cutting? We spend more on military than the next 11 nations combined, 8 of whom are allies. We waste uncounted billions of defense dollars. They've already made the cut that's meaningful; taxes to the rich. And we let it happen. Now, once again, the people will have to pay the difference. I hope the tea party is happy. This is all their doing. This is not smaller govt. This is the same old shaft that we've always gotten and will continue to get until those responsible for their mistakes (Wall Street!) are made to pay for them. Will they make meaningful cuts? Of course. To anything truly meaningful; education, help for the poor, social security etc. This question is like asking if kids will ever tire of Christmas morning. What do you want the government to cut? We've extended a massive tax cut for the rich. The GOP would rather cut 700,000 jobs that would pay for not even a quarter of the cost of the tax cuts they put in place. Why don't they just give everybody who makes over 100,000 dollar zero percent taxes and cut every thing and run the government out of a bunker. Sound good to you? Not until we are out of Iraq and Afghanistan. To rephrase the question: Will the mega-billionaires allow the changes in law to collect the billions they should pay the U.S. Treasury? It is inequality of income, the redistribution to the top started with Reagan. These people get massive tax breaks and most of the $$$. Until we quite cutting taxes and restore revenue balance no amount of cutting will change the balance sheets. No. Because meaningful means different things for either party, one protects the filthy rich and the other protects the poor and middle class.. So the one that protects who seem to be against smart people and protect the filthy rich will always attack anything for the middle class (who pay the bills) and the poor... Both side need to take deep cuts.. But everyone wants it all for free and no taxes.. No one wants to add IQ points still stuck in the single digits and understand NOTHING comes for free.. Tax cuts to the rich won't create jobs, This is a myth, not everyone who is rich has a business.. Majority of the rich earned it with hard work, but you still get to pay your share in taxes and proud real americans do..
Nope. That would mean cutting 350 billion from the military and the super wealthy ain't giving up the income that the miltary-industrial complex affords them. Did you read the reports from Goldman and Moody’s, showing what spending cuts will do to our economy right now, including the 700,000 jobs it will kill? The Moody’s report also indicates a government shut down will derail the recovery. So what exactly do you mean by meaningful, in light of this information? Yes, Washington will make serious cuts, once people stop accepting US dollars for oil and other essential commodities. In other words, when the dollar is no longer the world's reserve currency. It'll be much too late by that time though. The day's of rolling out trillions on the printing presses is soon ending. Someone should start talking about cutting the billions of dollars that go to foriegn aid but instead they quibble back and forth about cutting back on our schools and other programs that Americans need. What they want to take away from us will only put a small dent in the budget but hit the citizens where it hurts. Say a prayer and put our tax dollars back into America before passing it out freely to other countries. In 2000 GW and co were given a government with a surplus which he promptly split up with all of his rich cronies and then added 2 wars on top of that. Since no one really wants to give up any of the benefits given by gov. then the only real answer is to make everyone pay their fair share of taxes. Take all of the tax rates back to the Clinton era and then lets see what really needs to be cut. First let's start with the unending wars which are costing the most in money and lives unecessarily. Think what could be done with all of that money! I am poor but willing to pay more in taxes if everyone else does too...including the corporations, wall street, banks, big oil and all the mini and maxi millionaires out there. No, they never will to it is too late. They should start with their own salaries and benefits and work down from there. Put their money where there mouth is. Not until we end our wrongful Bush/Cheney wars and stop wasting trillions on military weapons of mass destruction. Not until Congress rids itself of corporate corruption. Not until taxes are shared equally by all and there are no exemptions for anyone. Not until everyone pays taxes including churches, hospitals, universities and all charities pay taxes. Not until we close our borders to American owned corporations that go overseas are taxed heavily for any goods imported back to the U.S. Not until we stop supporting dictatorships all over the world. Not until we close our borders to drug countries. In other words, no. It's not guts that Republican Governors and House leaders have shown, but hutzpah. The GOP created the budget crisis through tax cuts for the wealthy, expansionary Pentagon spending, and Bush's unfunded Medicare part D program. The problem with the $61 billion in Republican-proposed cuts is not just their size, but their targets. Their budget merely de-funds the likes of EPA and Planned Parenthood, but doesn't touch the real drivers of the deficit, like Pentagon and entitlement spending: it's ideological nonsense, not responsible government. Negative, the Federal Government will always have parochial interest ahead of what is best for the country. It will be up to the citizens, the voting public to make a real and fair difference or meaningful cuts and that means that the cuts will come from across the board and not just on the backs of the 12 % of the programs of the federal budget which typically falls on the middle to lower class tax payer. when Congress stops insulting the average intelligence of the average U. S. citizen and repent from the influence of lobbyist, then there can be a real effort towards the resolution of our deficit. Jack, the GOP only cares about deficits when the money isn't being spent on their agenda. They spent 8 years squandering a healthy surplus into a massive debt, voting all along to spend billions of dollars on a war, prescription drug plans and tax cuts with no plan to pay for ANY of it. They are running around now like the sky is falling, but at the same time unanimously voting for a tax cut that piled onto the debt by the trillions. They have absolutely NO problem with deficits when THEY are doing the spending. Now they are trying to villify the middle class and blame the debt on people who barely scrape by year to year? Anyone who is yelling and screaming about the deficit now, but who ALSO was against letting the Bush tax cuts expire or voted to extend them (including the President) is totally full of it and a bold faced hypocrite. What a complete hoax and once again the Dems fall right into trap instead of calling out the GOP for this breathtaking hypocrisy. here is an idea! have congress pay back social sucerity for all the suplus that was raised in taxes by the baby boomers to social sucerity and borrowed over the years leaving I.O.U.s in the account of social sucerity. that amount now is $2.5 trillion. that amount would fix social sucerity far into the future. now cut defense down to the price it cost for what it is named for defense only not the price we are paying for being the worlds policeman. next move up national health care to cover all the people which would put the gverment in a position to cure canser because they would be paying the bill for one of the biggest cost for healthcare. there is no reason that drug companies , hospitals or doctor want a cure because there is to much profit to be made in treating cancers not curing canser. ronald raegen borrowed from ssi for his arms race with the ussr and george w. bush and the republicans borrowed a $trillion dollars plus from ssi to pay for his wars. george bush borrowed $ 674 billion from ssi in just the last year in office. republicans spent us broke and now tell people they don't spend money like democrats do! baby boomers wake up your being blamed for something you didn't do by making ssi go broke! I am a VERY rich man. And if the government wants to raise taxes on people like myself, I will gladly take my jobs overseas – they are MY jobs by way because I created the company! I only earn two percent of all the income but I pay 50% of the taxes just like other people in my boat (yaht). As long as the government educated folks want to continue to take away the money I earned and give it to someone who did not earn it, I'll continue to plan my escape from this once great country. And I'll take my company and the jobs with me! They won’t agree until the cows come home unless, by some miracle, politics evaporates from the scene. Republicans have, once again, steered people into a near frenzy. They are using this situation – dire, to be sure, but not hopeless – to remake government in the image they’ve been aiming at for more than 30 years. Didn’t they get the message in November about JOBS, JOBS, JOBS? Putting people to work will do more toward reducing deficits and, eventually the debt, than the draconian cuts they are recommending, which will actually put millions more on the jobless rolls. Spending has to come down, but it has to be done more gradually so the situation doesn’t become much, much worse. Creating jobs creates tax revenue. In addition, the very wealthy must accept paying an appropriate share of the tab. Republican policies have resulted in “trickle-UP,” not trickle down. The middle class has been squeezed to the breaking point. The budget situation will not be solved until people recognize that spending cuts alone are not the answer and are willing to work on better taxation balance. In the meantime, it’s really important not to over-react and cut off our noses to spite our faces in the process. This recession could be a good thing if it was enough to finally wake people up to the realities of not dealing with our spending problems. For the past 3 decades we have overindulged ourselves and our children, getting worse with every year. I have faith, in possibilities but, it is very measured when it comes to the people of this country to put their self absorbed interests to the side and look at what is good for this nation as a whole. Where would we be if the founders of this country weighed what was easy and most financially beneficial to themselves alone. The problem is the people first, then the politicians. Is there a Balanced Budget law at the federal level? I don't think so. Until there is, there will never be a balanced budget. Of course, we CAN balance the budget – raise taxes for everyone, cut spending to the bone. So, what do we do when a bridge collapses? Do we leave it and set up ferries to cross our rivers. When roads start to crumble away, do we let them? People can ride a bicycle or better still, walk. When people start losing their jobs and cannot support themselves, do we kick all of them out on the sidewalk and let them fend for themselves. It is unfortunate that the two parties talk about spending and taxes as if both of them lived on different planets. The current fiasco we are facing and have been living for the last two years was conceived and executed by a Republican administration and a Republican legislature. Two unpaid wars that we are still fighting and an unfunded Medicare drug bill (written by the Drug Companies) started this ball rolling. I know there were other factors, but those three things accounted for eating up the surplus that the Clinton administration left for Bush and sent the deficit sky rocketing. True, it all came to a head with the bank collapse, when, like a house of cards, the whole thing started coming down. I'm not a financial wizard, but even I know that failure to balance my checkbook will bring me a whole lot of grief. I use my credit cards all the time – and pay them off at the end of EVERY month. It doesn't take a financial wizard to see that what we are doing is wrong. Solving our problems means making a lot of hard choices. I, for one, would be happy to pay more taxes if it meant that this country could get back to where we were at the end of 2000. But, I would expect the billionaires in the country to pay their fair share, as well. I'm not a Republican because I believe that we have to pay for what we get (ALL of us). I'm not a Democrat for the exact same reason. Neither party has any credibility when it comes to balancing the budget. I'm not sure they ever will. Jack asked, "Do you think the federal government will ever agree to meaningful cuts in spending?" Good heavens, of course not. That cuts to the very heart of politics, local, state, national. For there to be two or more political parties requires conflict, disagreement, something to scrap about, and spending issues are the easiest, laziest issue for politicians to disagree about. More importantly, the US Government is anything but bankrupt; as long as they have the power to tax, they control the ability to borrow, and as long as they can borrow, they can fund the debt. Even with a reduced credit rating, the US Government can't be bankrupt: they own too much real estate, infrastructure, property such as military hardware, intellectual property, etc. to file bankruptcy. And the bottom line is, again, they have the ability to erase the debt at will by taxing. The real question is not how to manage spending- that's a perennial game politicians love to play and aren't going to abandon- but how to end the special tax privileges politicians hand out to their influential friends. 45 BILLION in tarp money, our money and they recieved 1.9 Billion in tax break for 2009. By blaming democrats not to agree with the proposed cuts flames the issue at hand for a short period which you and Wolf like because it raises your ratings. Report the truth.